Pole banner printing gives you the outdoor visibility your business needs. Custom pole banners are popular with gyms, advertising agencies, events organizers, and other businesses that need to advertise outdoors. Pole banner sizes range from 1.5’ x 2’ to 2.5’. X 5’, making them highly visible and well suited for outdoor advertising in a host of different situations. Pole banners use 18 oz. blockout vinyl for pole mounted and 13 oz. white vinyl for wall mounted. The durability of the material makes it well suited for most outdoor conditions. They can be printed on both sides to maximize visibility, making impressions on pedestrians and drivers passing them on either side. 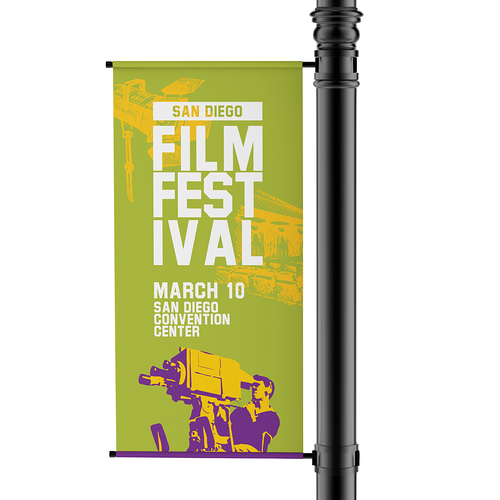 Pole banners can be ordered with street pole mounts or wall mounts, allowing you to set them up virtually anywhere. Single and double bracket types are also available to give you more mounting options. You can also order pole banners without brackets if you just need to quickly switch out banners on brackets you’ve already mounted. To print pole banner designs, just upload your artwork, or use our simple yet powerful design tool. You can also use our banner templates to ensure that your artwork is in the safe zone and that all bleeds and trims are accounted for. Be sure to check our banner order pages for awesome custom pole banner printing discounts. Print custom pole banners today. Note: The pole banner will be shipped in a bag and comes pre-assembled.